Hungary Steps Up Arrest And Deportation Of Migrants : Parallels While Hungarian authorities are transporting some migrants directly to Austria, they are also arresting others for illegal entry — and deporting them after brief court proceedings. 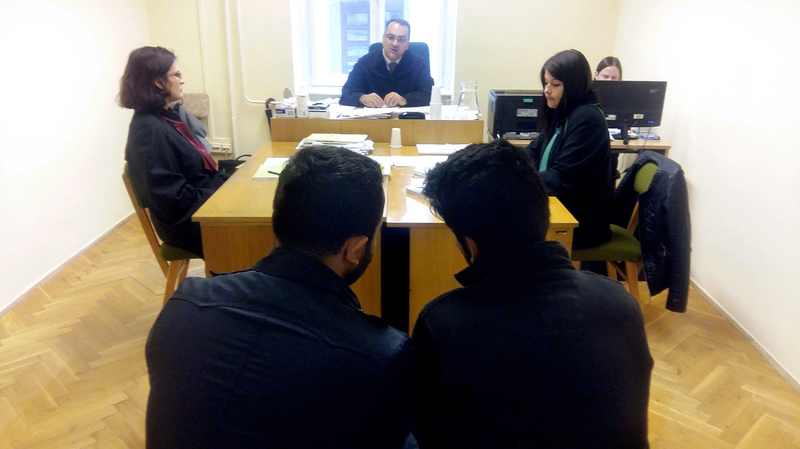 Mustafa Abdul Saleh (at right front), a 20-year-old Kurd from Syria, confers with a Kurdish interpreter (left), during his trial in Szeged, Hungary. Saleh passed through a hole in the razor wire fence that Hungary has built on its border with Serbia. Breaching the fence is a criminal offense, and Saleh was expelled from Hungary and ordered back into Serbia. On a road weaving through a forest on Hungary's southern border with Serbia, police lie in wait. Migrants who manage to squeeze through holes cut in a barbed-wire border fence and walk north eventually have to cross Route 55 — where Hungarian police are ready for them. Backed by agents from Frontex, the European Union's border control agency, the cops stop dozens of migrants and refugees as they emerge from the forest. They point guns and shine bright lights into the faces of frightened Iraqis and Syrians. The refugees, mostly men, are instructed to sit cross-legged in the grass, at the side of the road. Then police use dogs to corral them into a police van and take them to jail. Officials say an average of 100 foreigners a day are arrested here. That number is relatively low because last month, Hungary sealed its Serbian border with a 10-foot-high fence topped with razor wire. Migrants must now enter at official border crossings, with proper visas — or cut through the barbed wire and crawl through. The chaos and confusion of Europe's migration crisis is perhaps best reflected here in Hungary, where treatment of migrants is drastically different depending on which border they cross, and how. Hungarian troops are building a second fence along the border with Croatia, but that frontier is not yet closed — and some 6,000 migrants arrive there daily. Migrants who enter Hungary from Croatia are the lucky ones: They get free train rides across the country and then cross into Austria on foot in less than a day. It's an entirely different story on the Serbian frontier, where migrants are immediately arrested. Within a few days, most are put on trial at a special tribunal in the southern Hungarian city of Szeged. Each morning, groups of migrants climb out of police vans and trudge into the courthouse, under guard. Instead of evaluating their asylum claims, Hungary puts these migrants on criminal trial, under a law that took effect last month making it illegal to breach Hungary's border fences. Migrants can be punished with up to three years in prison. "They don't know anything about the procedure. The translators should explain it to them, with the lawyers' help," says defense lawyer Timea Kovacs. But court translators are paid by police, she says. They're sometimes biased. Testimony about who the refugees are and what they're fleeing back home in the Middle East or Africa is often ruled irrelevant. Only evidence about the Hungarian border fence is admissible in court. Officials allowed NPR to sit in on the trial of Mustafa Abdul Saleh, 20, a Kurd from Syria. He'd been arrested on the Serbian frontier two days earlier, after climbing through a hole he says someone else had cut in the border fence. The proceedings last less than an hour, even with pauses to allow a Kurdish interpreter to translate for the defendant. The judge sentences Saleh to two years' expulsion from Hungary, citing his "lack of remorse" for breaking Hungarian law. The defendant looks tired and bewildered, and confers with the Kurdish interpreter. He accepts a document outlining the verdict, in Hungarian only, and exits the small courtroom. In the hallway outside, Saleh exchanges greetings with another Kurd who sits on a bench, weeping, outside another courtroom door. In Saleh's case, the judge has ordered him deported back across the fence to Serbia. But the Serbian government refuses to accept such deportees. It says it's unfair for Hungary to push migrants back. So Hungary ends up keeping them. "They take them to immigration detention centers all over the country," Kovacs explains. She estimates that 700 to 800 people are in this situation — behind bars, even though the Hungarian court has sentenced them to expulsion only, not prison time — because Serbia refuses to accept them. They're expected to remain there until Serbia agrees to take them back or another arrangement is made. Outside the Szeged courthouse, children play near a fountain in a manicured park. Classical music pipes from speakers affixed to the facade of Szeged's neoclassical town hall. Parents sit on park benches. A baby bursts into tears. These are not locals. They're Yazidis — one of the most persecuted sectarian minorities in Iraq and Syria. No one here speaks their Kurdish dialect. "They came through the fence [on the Hungary-Serbia border], and the court decided they should go back to Serbia. But Serbia doesn't allow anybody, and the immigration office doesn't have capacity," says Balazs Szalai, who volunteers with a local migration aid group and came to the park to try to help the Yazidis. While Saleh was detained after his court sentencing, Hungary's overwhelmed immigration system didn't have space to detain the Yazidis after their own sentencing. So it ordered them to a detention facility in the far north of Hungary — hundreds of miles from the Serbian border where they are supposed to be deported. Hungarian officials also told them they can't provide transportation there. So the Yazidis are left in this park, searching for a place to sleep. There are at least four families — more than 20 people. The sun is setting. The fountain shuts off. Cold sets in. "I've called our lawyer, because they don't have money to get to that city," Szalai says between phone calls, trying frantically to find beds for the families. "We want to help, not just with food. We want to change the legal circumstances. Because they are humans." Even if Szalai is able to find temporary shelter for them, these Yazidi families — and Salah, the Syrian Kurd — will eventually be deported from Hungary. And when Hungary deports someone and bans reentry, it technically means that they're also banned from the entire Schengen area — 26 European countries that make up a passport-free travel zone stretching across most of the continent. So for the next two years, these refugees are also banned from Germany, Austria, the Netherlands, France, Sweden — any of the places where they'd hoped to request asylum, and start a new life.